Anis Chowdhury, Adjunct Professor, Western Sydney University and the University of New South Wales; held senior United Nations positions during 2008–2015 in New York and Bangkok. Jomo Kwame Sundaram, a former economics professor, was United Nations Assistant Secretary-General for Economic Development, and received the Wassily Leontief Prize for Advancing the Frontiers of Economic Thought in 2007. 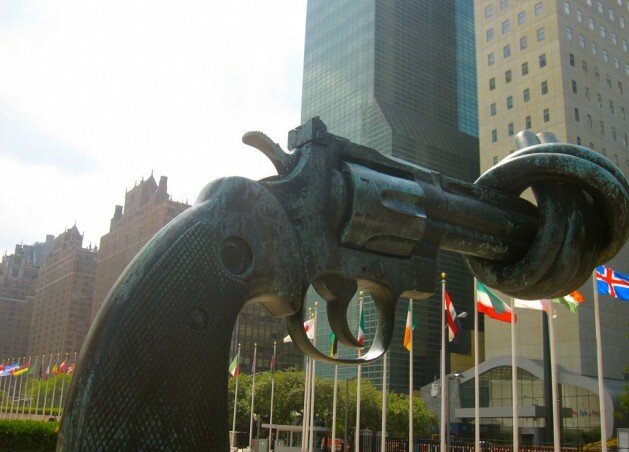 The iconic statue of a knotted gun barrel outside U.N. headquarters. Credit:Tressia Boukhors/IPS. SYDNEY/KUALA LUMPUR , Dec 14 2017 (IPS) - Although the Cold War came to an end over a quarter century ago, international arms sales only declined temporarily at the end of the last century. Instead, the United States under President Trump is extending its arms superiority over the rest of the world. Meanwhile, some fast-growing developing countries are now arming themselves much faster than their growth rate. Such expensive arms imports mean less for development and the people, especially the poor and destitute who constitute several hundred million in India alone. The end of the Cold War in the early 1990s had raised expectations of a ‘peace dividend’. Many hoped and expected the arms race to decelerate, if not cease; the resources thus saved were expected to be redeployed for development and to improve the lives of ordinary people. But the arms trade has continued to grow in the new millennium, after falling briefly from the mid-1990s. And without the political competition of the Cold War, official development assistance (ODA) to developing countries fell in the 1990s. Such ODA or foreign aid only rose again after 9/11, the brutal terroristic attack on US symbols of global power, only to fall again after the global financial crisis. 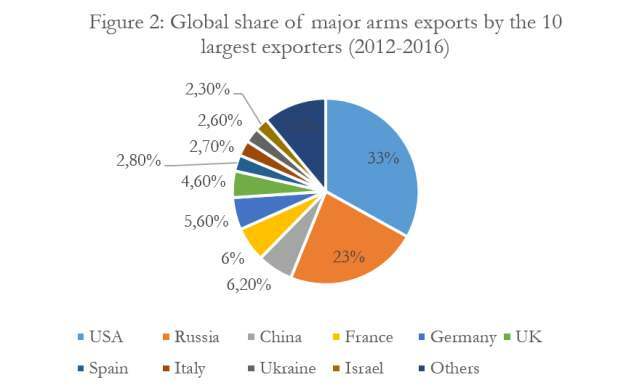 The Stockholm International Peace Research Institute’s (SIPRI) latest report on the world’s arms trade offers some revealing new data. The volume of international transfers of major weapons in 2012–2016 was 8.4 per cent more than in 2007–2011, the highest for any five-year period since 1990. As Figure 1 shows, international arms exports rose steeply until the early 1980s, after a brief decline during 1955–1960. It fell once again from the mid-1980s as Mikhail Gorbachev sought to end the Cold War which had diverted resources to military build-ups in developing countries. Foreign sales of military arms and equipment across the world totalled $374.8 billion in 2016, the first year of growth (by 1.9 per cent), after five years of decline. American companies had a $217.2 billion lion’s share of foreign arms sales. Seven out of ten of the world’s top arms companies were American, earning $152.1 billion, with Lockheed Martin leading with $40.8 billion. Figure 1. International transfers of major weapons, 1950–2016. Source: SIPRI Arms Transfer Database (20 Feb. 2017) Note: The bars show annual totals while the line shows the five-year moving average, with each data point representing an average for the five-year period ending that year. The SIPRI trend-indicator value (TIV) measures the volume of international transfers of major weapons. The five biggest exporters during 2012–2016 were the United States, Russia, China, France and Germany (Figure 2). US exports of major weapons increased by 21 per cent during 2012–2016 compared to 2007–2011. The major destination was the Middle East which accounted for 47 per cent. The USA exported major weapons to at least 100 states during 2012–2016, significantly more than any other supplying country. Russian major weapons exports increased by only 4.7 per cent. It sold weapons to only 50 states, with exports to India alone accounting for 38 per cent. Meanwhile, China’s exports increased by 74 per cent, as its share of global arms exports rose from 3.8 to 6.2 per cent. China’s arms exports to Africa grew most, by 122 per cent, to account for 22 per cent of its total arms exports. The five biggest importers were India, Saudi Arabia, the United Arab Emirates (UAE), China and Algeria. Indian arms imports increased by 43 per cent. Its imports during 2012–2016 were far greater than those of its regional rivals, China and Pakistan, as Pakistan’s arms imports declined by 28 per cent compared to 2007–2011. UAE imports increased by 63 per cent while Saudi Arabia’s rose a staggering 212 per cent! Saudi Arabia is the largest buyer of US weapons followed by South Korea. India, the world’s largest arms importer, has more of the world’s abject poor (280 million) than any other country, accounting for a third of the world’s poor living below the international poverty line of US$1.90 a day. Using a US$3.10 a day poverty line, more appropriate for a middle-income country, the number of poor in India goes up dramatically to 732 million. A study in 2014, led by the former chairman of the Indian Prime Minister’s Economic Advisory Council, C Rangarajan, estimated that 363 million, or 29.5 per cent of India’s 1.2 billion people, lived in poverty in 2011–2012, i.e., on less than Rs 32 daily in rural areas, and below Rs 47 a day in urban areas. Asia and Oceania was the main importing region in 2012–2016, accounting for 43 per cent of global imports, followed by the Middle East, with 29 per cent, and African states accounting for 8.1 per cent. Between the two five year periods, arms imports in Asia and Oceania increased by 7.7 per cent and in the Middle East by 86 per cent. Arms imports by European states fell by 36 per cent while African arms imports declined by 6.6 per cent. Tensions in Southeast Asia have driven up demand for weapons. Viet Nam’s arms imports increased by 202 per cent, pushing it to become the 10th largest arms importer in 2012–2016 from being 29th in 2007–2011. This was the fastest increase among the top ten importers. Philippines’ arms imports increased by 426 per cent while Indonesia’s grew by 70 per cent. Six rebel groups are among the 165 identified recipients of major weapons in 2012–2016. Even though deliveries to the six accounted for no more than 0.02 per cent of major arms transfers, SIPRI argues the sales fuel conflicts. Conflict regions alone accounted for 48 per cent of total arms imports to sub-Saharan Africa. According to SIPRI, governments fighting rebel groups used major arms against anti-government rebels.